I have such a backlog of neat plants to write about that it was tough to choose just three for this edition, but I think I’ve found some winners to amuse and delight. 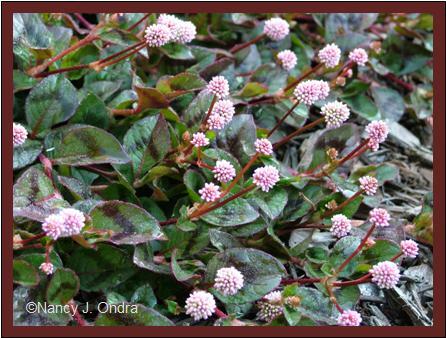 First up is a little cutie: pink knotweed (Persicaria capitata; also known as Polygonum capitatum). I know, I know, knotweeds can be scary with their propensity to spread, and if I lived where this one was hardy (mostly USDA Zones 8 to 11), I doubt I’d find it so cute. But here in mid-Zone 6, it reseeds very modestly, and I count myself lucky to get a few seedlings each year. I first acquired pink knotweed six or seven years ago, from seed from Chiltern. It had the cultivar name ‘Afghan’, but I can’t find any indication how (or if) it differs from the species, or from the other strains sold occasionally (such as ‘Pink Bubbles’). I planted the seedlings along the edge of my viburnum border, and they made a great edging. They reseeded nicely the next year – into the bark-mulched path, of course, not in the border, but that was fine, because they grow barely 3 inches tall. The following year I almost lost them, because I spread a new layer of mulch on the paths in spring, and apparently it smothered most of the seeds. Fortunately, one seedling did appear and grow to flower and seed, and I’ve had a few seedlings each year since then. 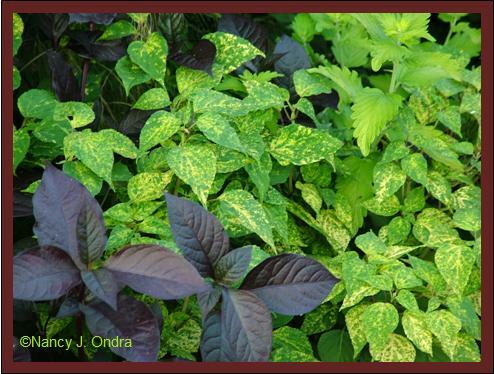 The self-sown seedlings don’t appear until late June or early July, and they’re hard to see, because the leaves are deep green with deep brown markings, so they almost blend into the mulch. The plant grows in a gradually expanding, ground-covering circle, rooting along the stems, then tiny, light pink flower balls start appearing at the shoot tips. The clump above is one seedling in mid-September, covering a space about 3 feet across. Below is a closeup of the blooms. 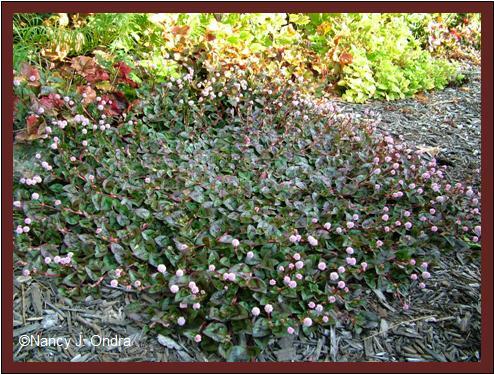 Gradually, the flowers start popping up toward the middle of the plant, forming a pink-dotted carpet that looks great until a heavy freeze. See, it’s just…well, cute! If you want to try this little charmer, JL Hudson has seeds for sale (as Polygonum capitatum ‘Afghan’). I’d say full sun to partial shade for this one. Next, something a little more in-your-face: ‘Dancing Flame’ scarlet sage (usually listed under either Salvia splendens or S. vanhoutii). This stunning variegated-leaf form was barely available by mail-order last year; this spring, I snatched up a few at a local greenhouse and saw it a few other places as well. The bright variegation – yes, it looks just like a classic mosaic virus pattern, but let’s not think about that – really stands out from a distance. It’s been nice for the summer, reaching about 30 inches tall and mingling well with the near-black leaves of ‘Purple Knight’ alternanthera (Alternanthera dentata) and a solid-yellow ‘Hint of Gold’ caryopteris. But it really wowed me in early September, when it finally started to flower – yowee! If you want to try ‘Dancing Flame’ next year but can’t find it locally, you may be able to get one through Logee’s Greenhouse. My plant gets only afternoon sun (about 1 pm to sundown), but I think it would be even happier in full sun. And finally, another new acquisition for me this year: Leavenworth’s eryngo (Eryngium leavenworthii). Pretty cool, huh? But what’s even cooler is that it’s an annual! I adore sea hollies, but I have a really hard time convincing them to overwinter. With this one, though, I can enjoy the fantastic blooms every year. I started the seeds indoors in early April and set the seedlings in the garden in the third week of May. Each sent a single stem upward and formed a bud, which then turned brown after a few weeks of drought in August. As the stems branched out, they gradually sprawled but then mostly righted themselves again to about 2 feet tall, and the silvery green flowerheads began appearing by the end of August. By mid-September, they started to purple up as the flowers began to open, and now the maturing blooms are absolutely amazing. This beauty thrives in full sun and average to dryish soil. Want to try it for yourself? Check out Thompson & Morgan for seeds. Hi Nan, only you could take such looked down upon plants, the salvia and the polygonum here, and feature them used beautifully in your garden. I have grown the little cute pink guy and it spreads nicely under shrubs. 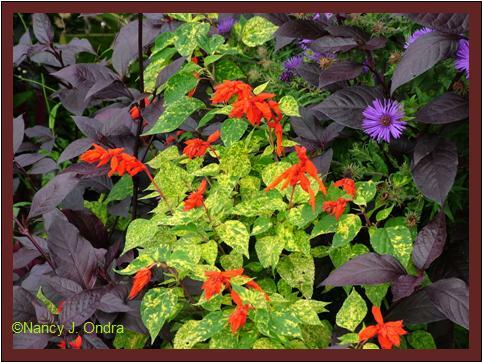 Your mosaic salvia does look terrific with the purple leaves too. But that eryngium is a knockout. I cannot get seeds of the sea hollies to germinate, they somehow do it on their own in the garden without my interference. What is your secret? I love the last plant Nan. Those colors are such a splash. Can you imagine seeing something likethis growing in the wild? Apparently it’s native to Texas, Oklahoma, Arkansas, Missouri, Wisconsin, and Kansas. I love the variegated salvia van houtii. I adore this particular sage in all its colour permutations (to my knowledge, red, orange and plum), as do my local hummingbirds, and it is always a late-season feature of my long border. I was not aware that there is a variegated leaf form, though. Currently, I have red and plum flowered varieties blooming happily in the garden. They started out as pathetic, gawky/straggily single stemmed 1 foot tall plants, which I dug into the garden in late June and early July (why can’t I ever keep up with the planting?). They now stand somewhere in the vacinity of 3 to 4 feet tall (we’ve had frost warnings here the last couple of nights — so far they still stand!! ), are full, lush and covered with blossoms. I work at a garden center on Sundays during the growing season (here in Connecticut from mid April to the end of September) and have tried to convince customers not to judge a plant by its appearance in the pot, and that once in the ground s. van houtii is a wonder. So far, my plant proselytizing has been to no avail, and the plants were thrown in the 50% off area fairly early on in July as unsaleable. I am not sure what happened to them after that. The eryngium is gorgeous — what an amazing colour. I’ve tried to have eryngiums in my garden for a number of years but have about given up. My experience has been that the voles love them as much if not more than I do. It’s really quite rude of them — they get all the gustatory enjoyment and I miss out on the visual pleasure. Ah, well, so it goes . . . Thanks for your comments, Nancy. You’re so right that the late-flowering salvias can be a tough sell; they don’t look very promising at planting time, and they can take up a good bit of space while they’re bulking up through mid- and late summer. But oh, how fantastic when they finally flower! Planting them in display gardens is one solution, I guess, but by bloom time, the customers are mostly gone, and the rest tend to get annoyed that they can’t buy a plant in full flower right then. Do try the Eryngium leavenworthii, if you can; maybe the voles won’t bother it during the summer? Hi Nan, I am so sorry to mislead you that the little poly is common here in TN. It was in another garden that I grew it and found it common along roadsides, etc. It may have been in CA, but really I cannot remember where, too many gardens in my history. I do not grow it here and still think it is very worthy of your attentions. I really appreciate the extra information, Frances. I’m always happy to learn how the plants that I know perform in different areas. What beautifully striking plants. 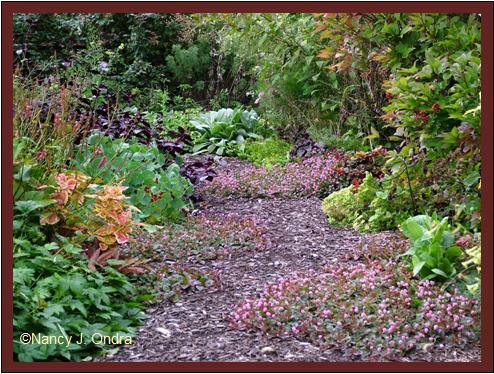 I am searching for a ground cover in a small confined bed that gets a lot of shade in the summer, unfortunately. Do you think your Polygonum might grow there? I’d really like to try it. Your others have started me thinking! ;-) I’m impressed that you, a garden author, write such inspiring blogs and are “accessible” to comment! Thanks so much! Thanks back to you, Shady; it’s not much fun writing if no one is reading! In regards to the pink knotweed, I don’t believe that shade would be a big problem. Now that I think about it, my own plants are in a bright spot but probably get little or no direct sun due to the tall plantings on both sides of the path, and they seem quite happy. So yes, do give it a try! Just keep in mind that you may need to start it anew each spring if you mulch every year, if you want to give it a jump-start on the growing season, or if you want to make sure it grows just where you want it to. I appreciate that you find seed sources for all of these when you post them, too. I’m going to go find myself some of that eryngium–especially since I just planted two of my own, and now am not sure whether they’ll come back or not. You mean the abutilon ‘Thompsonii’: the one with abutilon mosaic virus? Um…that’s not really helping. But I get your point; I love that flowering maple too! And good news about the eryngium seeds; I got the new Thompson & Morgan catalog a few days ago, and they have it listed again, so there should be no problem to get it. Enjoy! 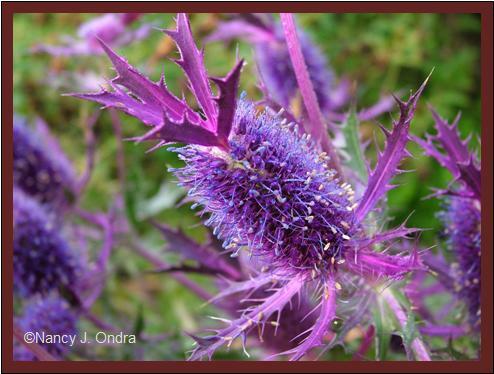 To Kim, I saw the eryngium featured in the newest Thompson and Morgan catalog. I want it too! You got your copy too, I see! They get earlier every year, don’t they? It’s exciting because it’s the first one, but I kind of prefer seed catalogs to come in November or December, once things aren’t so interesting outside and we can start planning for next year. I love your site! Great photos and information. 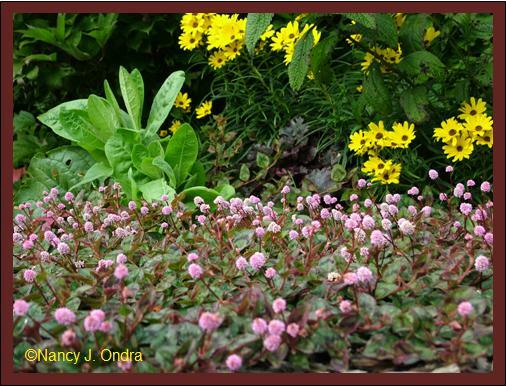 I just planted that cute little pink knotweed this year and it has spread quickly. It is doing just what I wanted, but I hope it doesn’t become a thug. I live in Zone 7. Welcome, LaDonna! I think the knotweed plants won’t overwinter even in Zone 7, but if your plants flowered earlier than mine do, maybe you’ll get more seedlings. If you’re worried about it, I’d try covering the area with 1/2 to 1 inch of mulch in spring. That seems to smother mine. 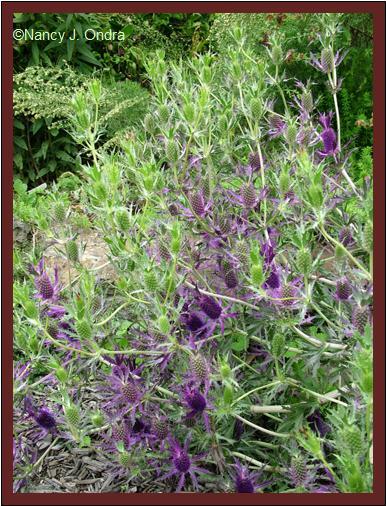 I remember getting some of the eryngium seed you donated to the HPS Exchange, and some from T&M as well. I think most of my plants came from the latter batch, but I may have gotten one or two from yours too. I hope mine self-sow, but they don’t look promising, so I think I’ll be buying seed again just to make sure I have the plant again. Nan, I popped over to read your Bloom Day post and have been distracted by several other interesting posts that I’ve missed, including this one. 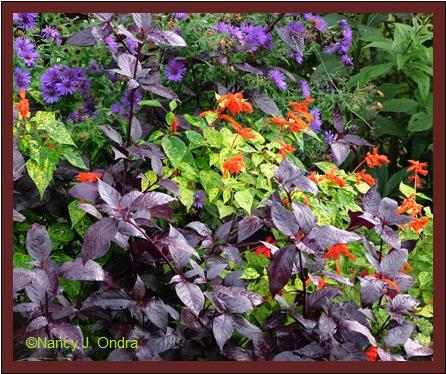 All 3 plants are great, but I especially like the Salvia. It looks fabulous next to the alternanthera. I’ll have to try Purple Knight in the garden. It looks wonderful against that bright yellow-green! I have that Abutilon you and Kim were talking about. It’s gorgeous! As soon as I saw your Salvia I was reminded of the Abutilon. Your little poly reminds me of the ‘smartweed’ we have here, which the Japanese beetles love to hang out on. I always admire the pretty weed, but what a pest! Ugh, we have that smartweed here too, and you’re right – what a pest! But I still do love this little one, and the giant Persicaria orientalis as well. Thanks for your comments!